This is MY OWN version of tagliata di manzo. I like my meat simple, without too many spices, to fully taste it. I made it for Goldilocks and she loved it! *We surely want to keep the oven temperature under 100°F, otherwise the meat will keep cooking and won’t be rare inside. To make the color of potatoes stronger, you can add a tiny bit of tomato concetrate sauce (1/8tbsp) mixed with 1/4 cup of water. The tomato concentrate quantity isn’t enough to add taste to the dish, but is more than enough to round and blend all tastes together and give them a wonderful strong golden color. The small quantity of sugar inside, moreover, will help the potatoes caramelize. Approximately .5 liters of vegetable broth. 1/8 tsp tomato paste (optional). Boiling the potatoes is optional, but will help them cook faster. Boil a pot of water, and then add some salt. Place some olive oil in a frying pan, then sauté a smashed slice of garlic, the sage and the rosemary over low temperature. In another pot, bring the vegetable broth to a boil. Slice the potatoes in rectangles of more or less an inch by half an inch. Try to keep them all the same size so that they will cook evenly. Put the diced potatoes in the boiling water and drain one minute after the water starts to boil again. This will help the potatoes cook faster, and will add some salty taste to them from the beginning. After draining the potatoes, remove the garlic and then raise the heat on the frying pan, then add the potatoes. Once the water from the potatoes evaporates, simmer with a glass of white wine until reduced. Then reduce the heat to medium and start adding the boiling broth one ladle at a time, until all the potatoes are soft but still firm. Don’t mix them with a spoon, you’ll break them, just “make them jump” in the frying pan. (Goldilocks note: In Italian they say “saltare in padella” literally meaning to “jump something in the pan.” This is the English equivalent of flipping or tossing something in the pan). Add another 1/3 cup of broth, adjust the salt and add a pinch of powdered garlic. This is your last chance to add other spices if you want to, because we’re now going to cook the potatoes without adding more liquid. This is the moment I add some chili pepper powder if I want them hot. Non-edited golden roasted color obtained with a little tomato concetrate. Keep cooking the potatoes until they become golden, and keep “jumping” aka tossing them from time to time to prevent them from sticking to the pan. If needed, add another tablespoon of olive oil. Once ready, lower the heat to the very minimum (do not cover) and proceed with the meat. Again, meat should be at room temperature and you should have your dishes already hot in the oven at 86°F. Heat a grill pan (cast iron is the best here) over very high temperature, until hot. While the pan is heating up, blot the meat with a paper towel to absorb any liquid. We want the meat to start cooking the very moment it touches the iron, and any liquid on its sides will prevent that. Place the meat on the grill once it’s very hot, and leave it there for one/two minutes, depending on the thickness. Then turn it 45° for another one/two minutes. Then flip it over and repeat the process. You want the meat to cook on all the borders but be rare (yet hot) inside so cooking times may vary according to its thickness. For a 1-inch thick steak, it’s usually about two minutes per side. Once ready, place it in aluminum foil (or aluminium for our British friends) and wrap it up, then leave it inside the oven with the dishes for 5 minutes to rest. This is the moment all the water inside will toughten and make the meat soft and juicy. Remember to keep the temperature at 86°F, or it will cook. Take it off the oven, open the aluminum foil and drain the excess water. Cut the meat in approximately half an inch thick slices, perpendicular to the grain, so that it won’t be chewy. 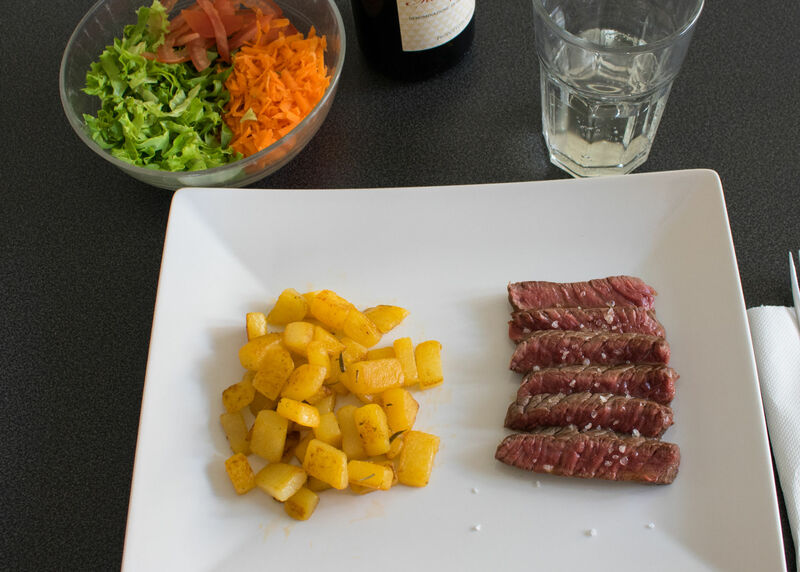 On the hot plates you preheated earlier, add the potatoes on one side and the sliced meat on the other side like in the picture. If you did it correctly, the contour of the meat will be cooked and the rest will be rare but hot and not bloody. Pour some fresh, high quality olive oil and course grains of salt on the meat like in the picture below then serve ASAP. Finish with a salad to cleanse your palate after the meal.